Yes, very exciting times for White Bus. In about 10 days we've got two 16-plate 10.8m E200s coming to go on the 446 which will displace the current 67-plates to the 441 and enable us to send the Abellio loan Darts back (so if you want to spot them you've not got long!). For the new routes (48, 81 [2 morning journeys], 437, 462/463 and 500) 5 brand new 8.9m E200 MMCs are coming in the latter half of August. 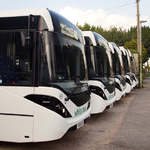 They will be 68-plate for service on the 1st September. New timetables will be online next month when I finish them! Note route branding on the side. The new Falcon MMCs are YX68 UJP/R and ULP/R/S, the latter three following on nicely to the aforementioned White Bus ones which are ULT/U/V/W/Y! Have now sampled the 461 under Falcon - impressed. If Falcon keep up this level of work they could do a lot of good for the North Surrey bus network. Does this raise the possibility of Arriva eventually closing Guildford? They are currently competing with some force against Safeguard in particular. I can’t help feeling that it’s a somewhat desperate move from Arriva, and I wouldn’t be massively surprised to see them pull out of Guildford within a year. I haven't even clicked on the link but when I read the title that was my immediate thought. Putting pressure on a key part of the cost base is a pretty classic sign that all is not well in terms of the operation's profitability. To be honest I'm astonished that Arriva have held on to a relatively small operation for as long as they have. Surrey long ago ceased to be the home for a large corporate operator - far too much uncommercial work and therefore a lot of lower cost operators fighting for work. Abellio held on for far longer than I ever thought they would but they were forced to admit defeat. I'm even surprised Stagecoach have kept any sort of foothold, ignoring what works in from neighbouring Hampshire. Stagecoach have managed to win couple of high profile contracts that provide a good baseload, specifically the University routes and the Park and Ride (which gets new electric buses soon). I would assume if they didn't have these then maintaining a Guildford base would be much more marginal. As for locations, the Arriva garage is central and riverside (maybe too close to the river as it has flooded on occasions) so is probably a valuable site. Stagecoach are at an Industial estate in Peasmarsh, south of the city centre. Safeguard are also out of town but in Jacobs Well, north of Guildford, at a site that used to be used by recycling trucks. Stagecoach’s 715 is a regular route for me, and it attracts way more passengers than Abellio’s 515 ever did. The depot manager spoke at a public meeting recently saying they are having a network review next year and admitted himself Woking is increasingly becoming the more successful part of the depot’s operation. He even stated that Arriva are committed to Surrey, but that that doesn’t necessarily secure Guildford, with opportunities such as those offered around airports always considered. The 515 wasn't exactly running around empty though?